Australia have called on David Pocock, Berrick Barnes and Stephen Moore ahead of their northern hemisphere tour. Pocock has been sidelined with a knee injury which kept him out of five of Australia's Rugby Championship matches while Moore damaged his hamstring against New Zealand in August. Barnes missed the final two matches of the Rugby Championship with a lung problem. 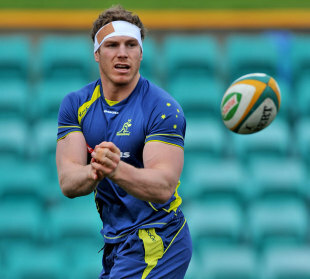 And coach Robbie Deans, who will be under pressure to return from their matches against France, England, Italy and Wales with a win due to their mixed fortunes during the Rugby Championship, will ease Pocock back into action. Deans said: "Poey has done very well... he's still got a bit to do in terms of being available to be selected but he's clearly going to be available and hence he's coming with us." One notable omission is Scott Higginbotham who was hit with a two-match ban following his incident with Richie McCaw. "To have included Scott within the 30 would have created an additional challenge in terms of selection for the opening two matches, which would have compromised the group," Deans said. "Scott was aware once he was suspended that this was a possibility."